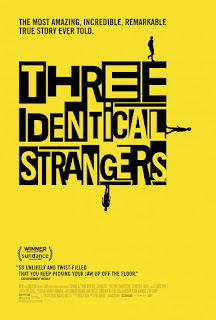 Word of mouth sent me to "Three Identical Strangers." Let me tell you: Go see it. The story moves from quirky & happy to dark & creepy, as filmmaker Tim Wardle uncovers the separation of three identical brothers at birth. Eddy Galland, David Kellman, and Bobby Shafran grew up in the suburbs of New York, knowing they were adopted, but never knowing they were identical triplets separated at birth. In 1980, coincidence brought two of the triplets together. Publicity over their reunion got to the third brother, who joined them. National media celebrated the reunion without questioning why they were separated. The story goes from bright to dark, as the brothers discover their role as "lab rats." This has been an extraordinary year for documentaries. "Three Identical Strangers" may be the most extraordinary of them all. "Three Identical Strangers," 4 stars. Does it deliver what it promises? Shocking, powerful story. Is it entertaining? Jaw-dropping. Is it worth the price of admission? One of the year's best.